With just 31.1 seconds remaining, Michael Carter-Williams, who had missed two of those four, set his feet and shot his way into the record books, making Houston's 26th 3 of the night to set the mark and help Houston to a 136-118 win over the Wizards. HOUSTON (AP) — The Houston Rockets were on the cusp of NBA history, just one 3-pointer away from setting the league record for most 3s in a game. The crowd chanted: “Three, Three, Three,” every time Houston got the ball and let out a collective moan after each of four straight misses as the clock ran down on Wednesday night against the Washington Wizards. Then, with just 31.1 seconds remaining, Michael Carter-Williams, who had missed two of those four, set his feet and shot his way into the record books, making Houston’s 26th 3 of the night to set the mark and help Houston to a 136-118 win. James Harden scored 35 points as the Rockets won their fifth straight game. He made six 3s, Chris Paul added 5 and Gerald Green and Eric Gordon made 4 each on a night Houston attempted 55. Carter-Williams joked that the reserves who were on the floor at the end of the game would never have heard the end of it if they hadn’t at least tried to set the record. Harden believes they would have had a tougher time dealing with the fans. A 3 by Gary Clark tied the record with 2:42 left before Carter-Williams made the record-setter. The previous record was held by the Cleveland Cavaliers, who made 25 against Atlanta on March 3, 2017. Paul was happy to help Houston set the record, but didn’t realize what was going on until he heard the crowd. Houston had a comfortable lead throughout most of this one and seven straight points, capped by a dunk from Clint Capela, made it 111-94 with about nine minutes left. Tomas Satoransky and Bradley Beal made back-to-back 3-pointers for Washington after that, but Harden ended the run with a 3 that left Houston ahead 114-100. The Rockets then used a 12-3 run, with all their points coming on 3s, to make it 123-103 with about five minutes left. Harden and Gordon both made one in that span and Green capped the spurt with two, and coach Mike D’Antoni cleared the bench soon after. Beal had 28 points to lead the Wizards, who lost for the sixth time in seven games. Houston led by 12 at halftime and a basket by Paul left the Rockets up 80-64 with about nine minutes left in the third quarter. The Wizards used a 6-3 run, with four points from Wall, after that to cut the lead to 83-70. 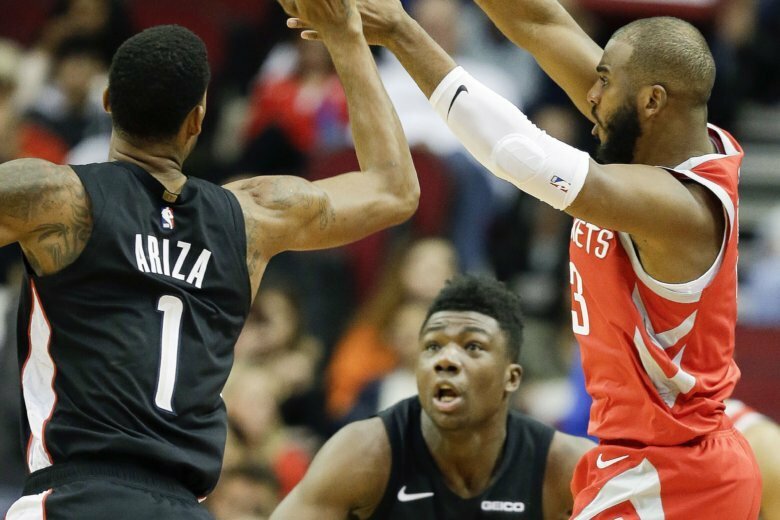 The Rockets made four quick points later in the quarter, highlighted by a nifty reverse layup by Gordon, to leave them up 91-76 with about 3½ minutes left in the quarter. Washington got within 11 late in the third quarter, but Harden scored the next five points, capped by a 3-pointer, to make it 101-85. The Wizards scored the last five points of the quarter, with three free throws, to cut the lead to 101-90 entering the fourth. The victory comes after the Wizards won the first meeting against Houston this season 135-131 in overtime on Nov. 26, despite a season-high 54 points from Harden. The Wizards often double-teamed Harden in the first half, leaving others open, which led to easy baskets in the lane and a 70-58 lead by the Rockets at halftime. Wizards: Made 10 of 30 3-pointers. … John Wall added 18 points with 12 assists. … Trevor Ariza had 15 points in his second game since a trade from Phoenix. Rockets: Gordon added 18 points. … James Ennis missed his fourth straight game with a strained right hamstring. … Houston had 15 turnovers. The Rockets played a tribute video for Ariza during a timeout in the first quarter after he spent the last four years with the team before signing with the Suns in the offseason. Ariza, who was traded to the Wizards last week, smiled and waved to the crowd as fans gave him a hearty ovation after the video. Wizards: Host Phoenix on Saturday night. Rockets: Visit Miami on Thursday night.